The Chair of Chinese Legal Culture at the Institute of East Asian Studies seeks aspiring young scholars in the field of Chinese law and welcomes applications for a PhD degree in Chinese Area Studies. The University of Cologne offers world-class library resources and excellent support facilities for doctoral students. The Institute of East Asian Studies features a research library with up-to-date and original sources of Chinese law as well as access to the leading Chinese academic research databases. Research in Chinese law at the University of Cologne focuses on constitutional development, in particular on judicial reforms and rights litigation. Chinese administrative law including policies, laws and practice of regulating international migration to China is a further focal point of our research. Chinese practice of public international law and Chinese scholarly views on issues of public international law as well as domestic implementation of international treaties form another area of research. Finally, we investigate issues of comparative law, legal transfers and legal culture, which are related to Greater China and Chinese legal development. 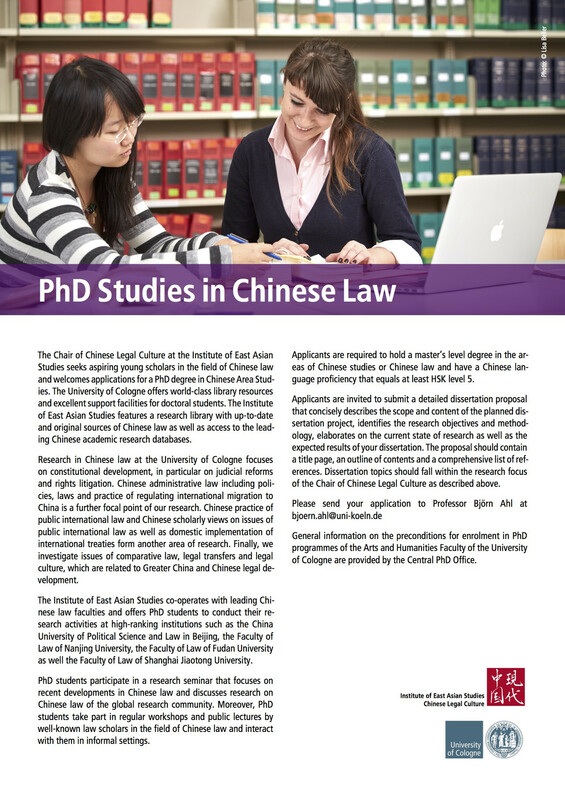 The Institute of East Asian Studies co-operates with leading Chinese law faculties and offers PhD students to conduct their research activities at high-ranking institutions such as the China University of Political Science and Law in Beijing, the Faculty of Law of Nanjing University, the Faculty of Law of Fudan University as well the Faculty of Law of Shanghai Jiaotong University. PhD students participate in a research seminar that focuses on recent developments in Chinese law and discusses research on Chinese law of the global research community. 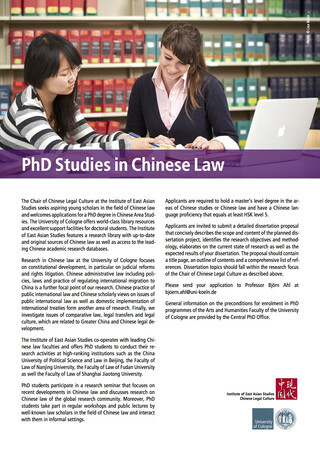 Moreover, PhD students take part in regular workshops and public lectures by well-known law scholars in the field of Chinese law and interact with them in informal settings. Applicants are required to hold a master’s level degree in the areas of Chinese studies or Chinese law and have a Chinese language proficiency that equals at least HSK level 5. Applicants are invited to submit a detailed dissertation proposal (about 15 pages) that concisely describes the scope and content of the planned dissertation project, identifies the research objectives and methodology, elaborates on the current state of research as well as the expected results of your dissertation. The proposal should contain a title page, an outline of contents and a comprehensive list of references (please refer to the style guide for papers). Dissertation topics should fall within the research focus of the Chair of Chinese Legal Culture as described above. General information on the preconditions for enrolment in PhD programmes of the Arts and Humanities Faculty of the University of Cologne are provided by the Central PhD Office.